New ListingBoho floral foldover waist wide leg palazzo yoga pants pink/mint "S"
Unless its a defect item. (except when the item received was defective). 11/12 Long. Excellent condition. The pictures provided are of the actual item for sale. 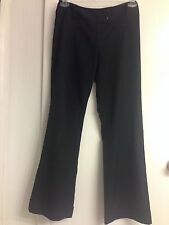 Chevron pattern foldover waist wide leg palazzo yoga pants brown/pink "M"
Unless its a defect item. Floral ornate foldover waist wide leg palazzo pants mint "Small"
Tracy Evans black wide leg pants. Zip up front with button and double clasp closure. New ListingBoho floral foldover waist wide leg palazzo yoga pants pink/mint "Medium"
Unless its a defect item. Wrinkle Free. (except when the item received was defective). New ListingBoho floral foldover waist wide leg palazzo yoga pants pink/mint "Small"
Maurices flat front wide leg dress pants. Front Rise : 10 1/2". Condition is Pre-owned. Color : Gray. Waist : 18" Flat across waist.